We have not been able to locate a lot of history on the old Midway church but if some emerges we will add to it as we go. There is a limited amount of information in the Pitts Library at Emory that tells us the church was built in 1857 on “land lot number 122 and fourteenth district”. 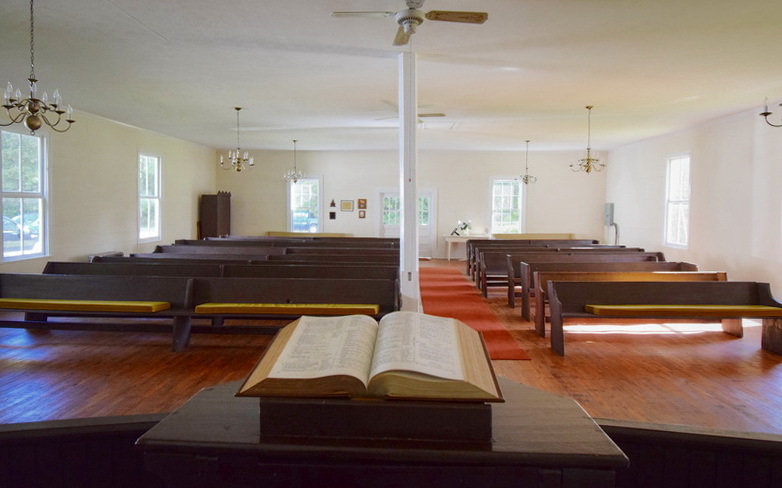 The church was formed as a result of a consolidation of two earlier congregations – Liberty Hill Methodist and another called Rehoboth Methodist at Antioch. 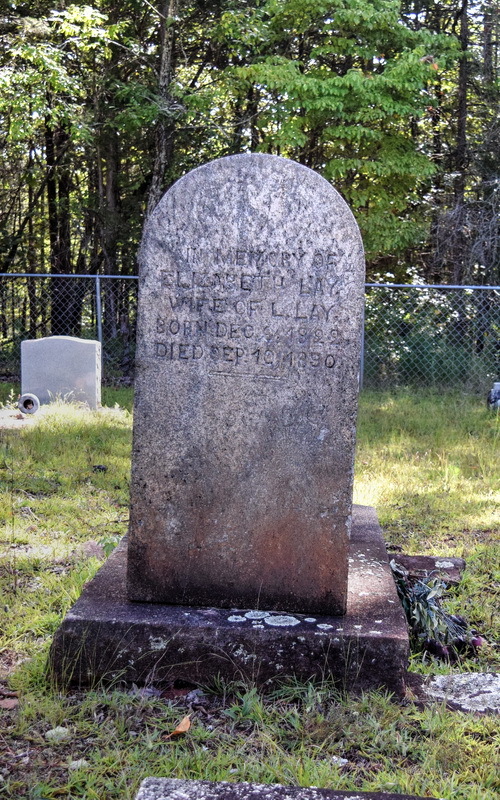 The old cemetery associated with the church is at the original Liberty Hill church location, close by but actually located in Heard County. Apparently the name Midway reflected the convenience of the new location. 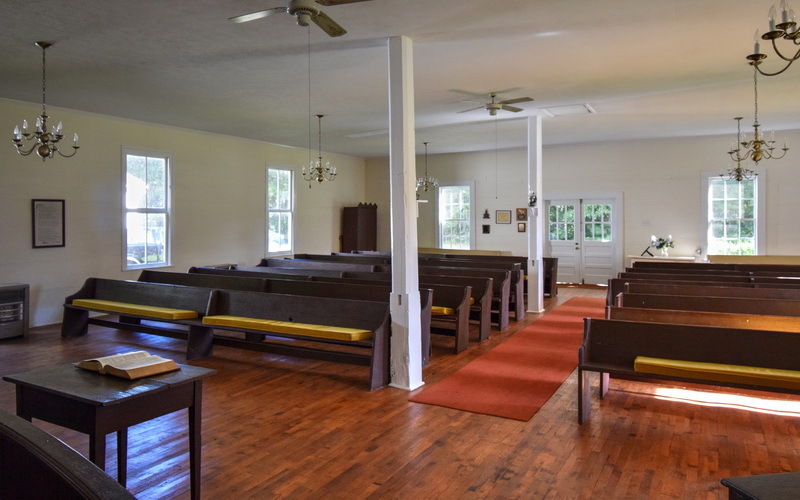 The property for the church was donated by John T. Boykin, Sr. who donated three acres for its construction with the stipulation that if the church became abandoned or ceased to be used as a church, the property would revert back to the heirs of Mr. Boykin. These “reversion clauses” were fairly common in the 19th century. The Boykins were a local family of some wealth prior to the Civil War. The 1840 federal census shows John Jr. at the age of 39 living with wife, children and 16 slaves. His son, John Jr. served as a captain in Company F in the 21st Ga Infantry. He was pardoned by President Andrew Johnson in late 1865 for “all offenses by him committed, arising from participation, direct or implied in the said rebellion”. The history tells us the church was built with donated lumber, labor and money from the members. It also states that some of the lumber was secured from the Wilder estate. The title to the surveyed land is interesting in that it reads “Beginning at a small chestnut oak bush near Mrs. Sloan’s line, thence running westward along said line to a sassafras bush; thence southward to a persimmon tree; then crossing the public road to another persimmon tree; thence northward to starting point”. We are grateful to the congregation of Midway for their stewardship of this historic old church. 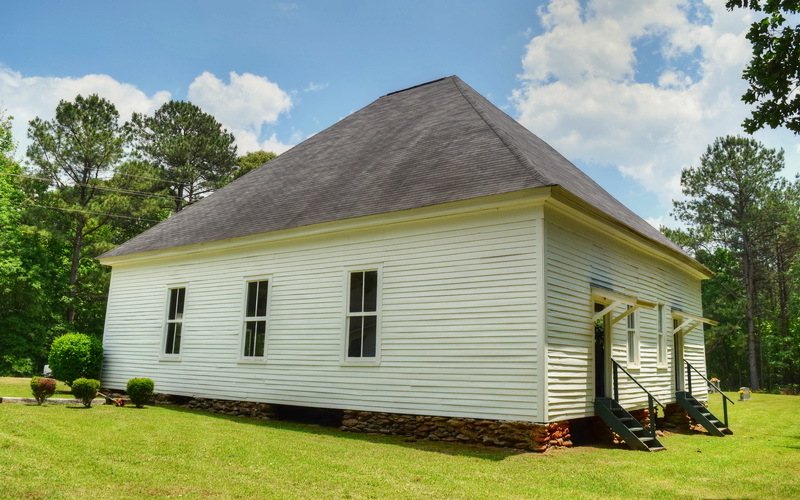 It has been maintained with a strong sense of the architectural integrity that has survived for 150 years in this rural location on the edge of Troup County. This view toward the rear of the church gives evidence of this buildings old age. Though the front roof is mounted by a handsome wide gable, probably added in the 20th century, this rear photo presents a simple hipped roof building, clapboard siding and two small rear doors each covered by a primitive-style wood awning. The front two windows are sashed six over six clear glass paned windows. The front double doors each have six paned glass windows. On the other hand, the six windows found on less-seen sides of the church as well as the two small apse windows, are all much more simple, sashed two over twos and less ornate than the front. Finally, the stacked stone foundation walls are common for a rural Georgia church in the mid-19th century. 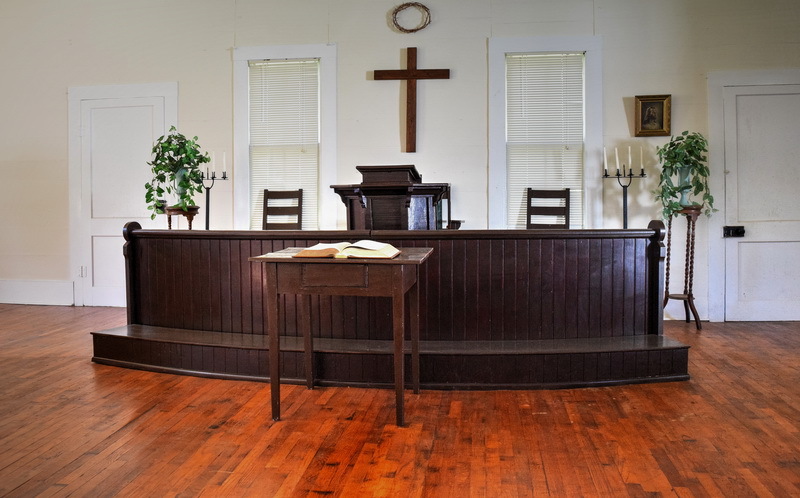 Here we see the heart pine, wood floors, hand hewn wooden pews and charming simple interior typical of a church of its era. Because of its hipped roof architectural design, interior columns are required to provide support of the sanctuary’s ceiling and roof. 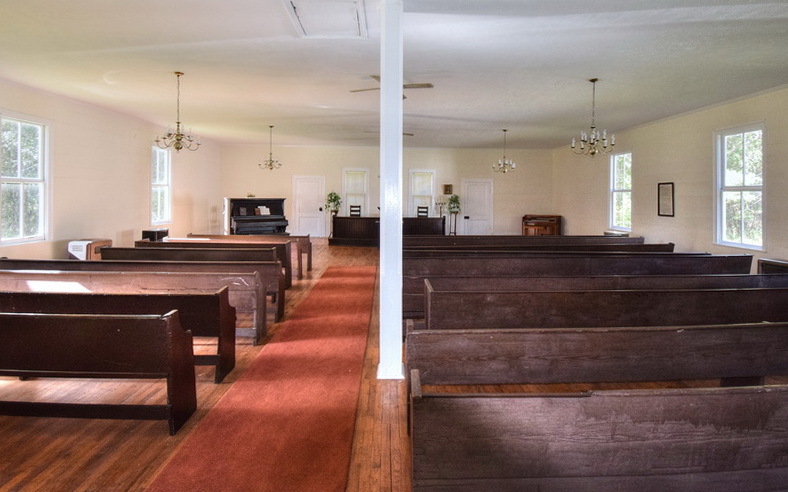 Note that the columns are as thin as possible to insure the best, unobstructed line of sight views of the preachers in the chancel area from every seat. Here we can see how inviting this little sanctuary is. Ambient lighting from the large clear-paned, glass windows floods the room. The all white interior reflects and re-reflects this light that brightens the room. We can also appreciate once again how the slim, white columns seem to disappear and provide no view obstruction. Here the tranquility and peace within the building is on display. And its interior authenticity becomes even more apparent in this view. The graceful, chamfered columns rest easily on the heart pine floors while they stately offer support for heavy ceiling and roof……. just as they have for over 150 years. This old piano sits near the pulpit ready to be brought to life by the choirmaster. Of course, it is not the original since upright pianos such as this on were not available until later in the century. But, you can bet that a pump organ or an instrument of this sort has always been part of the services at Midway. 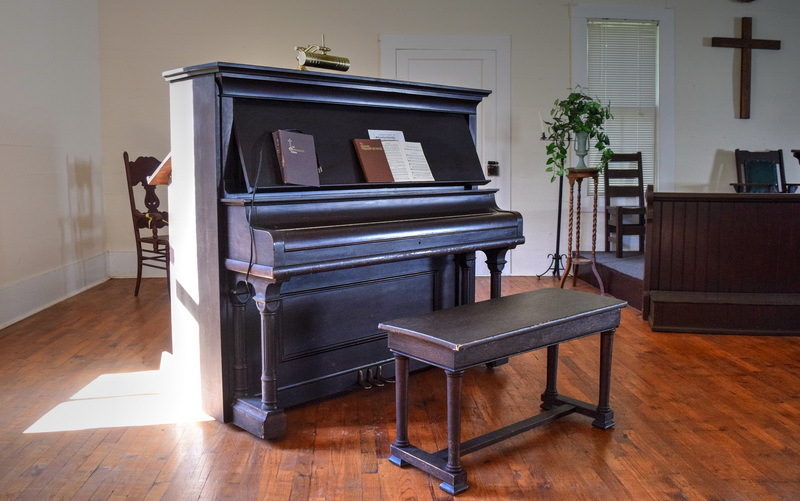 Music/singing has from the beginning been integral to Methodist congregations. Methodist hymnals are lengthy, legendary and remain in common use today. 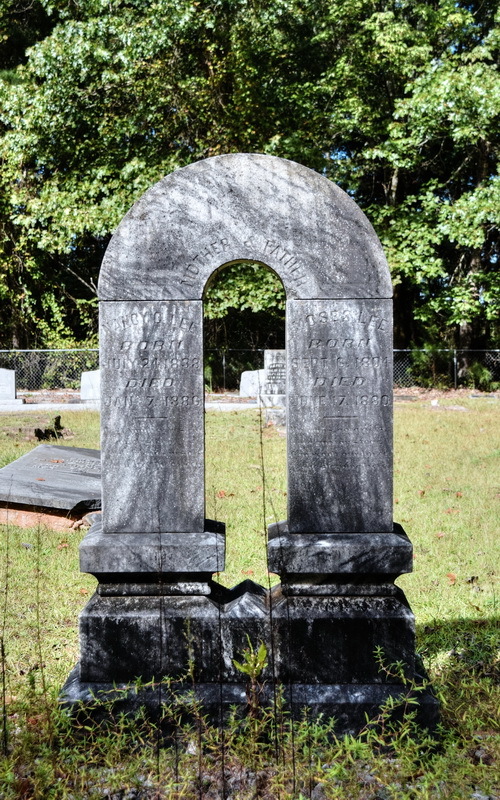 Here lie Moses (1804 – 1880) and Nancy Lee (1838 -1886), married on Aug 12, 1855. When Nancy Gatlin married Moses, she was 17 and he was 51. We think this was the second marriage for Moses but apparently, he had no children by his first wife. Moses and Nancy had at least five children. In 1870 the county census lists him as a grocer in the 1889 census he is listed as sick with consumption. The history of Troup County shows Moses Lee as Clerk of Superior Court from 1842 – 1848. Elizabeth Lay was the wife of Littleton Lay (1819 – 1912). Littleton Lay married Elizabeth Hubbard on Jan. 9, 1840 in Troup County. He applied for a Confederate Pension in 1911 when he was 91, stating that he served in the Georgia Militia during the war and was serving at Fort Tyler, West Point, GA at the end of the war. 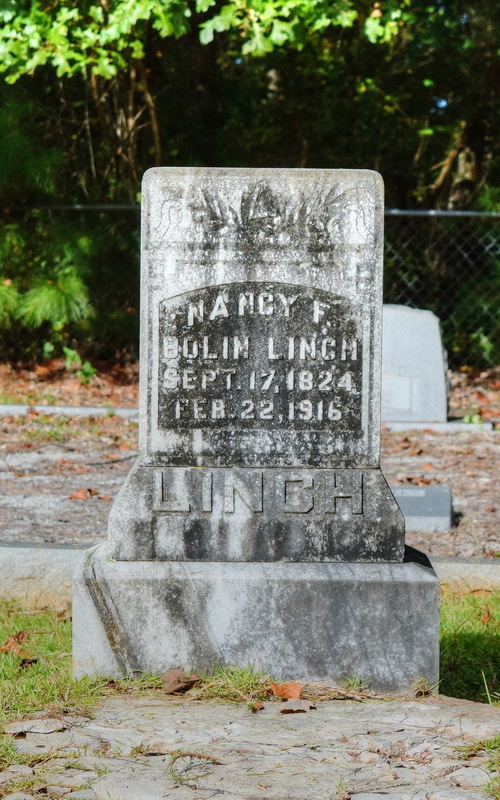 Nancy F. Bolin Linch was married to Solomon Linch on Dec. 24, 1846 in Troup County. In the 1850 Troup County census they are both 24 years old with small children and some older Bolin children - probably siblings or other relatives of Nancy. The LaGrange Reporter, 1 Jan. 1857, page 4 shows Daniel Bolin applied to be administrator of the estate of Solomon Lynch, deceased. Nancy, as a widow, apparently lived in Atlanta for a number of years with her daughter Roxanna Rachel Linch Sloan.